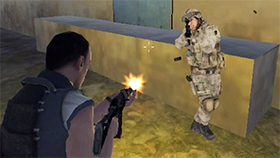 Welcome to Army Training - Field Forces, an interesting army, shooter, and 3D FPS video game. It brings you to a cool battlefield where you have to shoot and kill the enemies as quickly as possible. But first, you have to complete your army training missions with many hard tasks. This game offers the players an awesome 3D first person viewpoint that will make you are addicted. To survive, you need to react quickly and shoot accurately to kill your opponent and win the match. Your enemies are hiding somewhere and you have to find them. So be careful! At the beginning of Army Training - Field Forces, you have 50 bullets and 5 HP. Pay attentions to your health and try to win the match as fast as you can. The game offers you two modes: Play normal and Play hard. If you are a newbie, I think that you should select the Play normal mode to enjoy the game. Good luck and have fun! Use these WASD keys to control your soldier. Use mouse to attack (left click to shoot). Use the Shift key to crouch. Move wisely, look at the map carefully, and shoot accurately. Choose a good position while fighting an enemy. Are you looking for a great place to play Army Training - Field Forces Unblocked? If so, you can visit our site Freegames66.com. 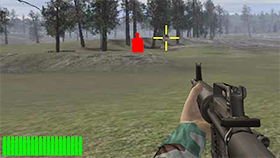 Here we bring you Army Training - Field Forces Unblocked with a cool user interface, and it’s free. Moreover, we also update new and hot unblocked games daily so you can be the first person to enjoy them! Now, enter Army Training - Field Forces Unblocked, move wisely, look at the map carefully, and shoot accurately!